Doug Turnbull writes science fiction based on hard science. Most of his books, novellas and short stories confront problems faced by early settlers of other worlds. He contributed this article to SPACE.com's Expert Voices: Op-Ed & Insights. Pathfinder hung in space about a mile behind and below the Mission Assembly Habitat (MAH). From the vantage point of the MAH, the ship appeared small and was a shining, roughly cylindrical shape, the details of a complex array of tanks and machinery that occupied the rear half of the structure just barely discernible from this distance. In reality, Pathfinder was over two hundred feet in length and twenty-five feet in diameter. Fuel tanks, machinery, and the combustion chambers of its engine occupied the rear half of the craft, while the cylinder containing the crew quarters and the stack of five Orion II landing craft occupied the front half. The blue expanse of the central Pacific shone brightly in the background. Suddenly the view of the Hawaiian Islands at the rear of Pathfinder blurred as the gasses from its engines exhausted, and the ship began to move, quickly appearing to catch up and pass the habitat. Cameras on board the MAH captured the event, tracking the ship's progress. Pathfinder disappeared within a minute. — From "Pathfinder: Mission to Mars"
Cover art for the novel "Pathfinder: Mission To Mars." By assembling mission ships in low Earth orbit (LEO), it is possible to mount deep-space flights using existing equipment. In order to accomplish this, the mission will need a crew habitat in a permanent LEO congruent to the solar system's plane of the ecliptic, the plane on which most of the planets travel in their journey around the sun. Unfortunately, the International Space Station (ISS), orbiting over 25 degrees above the ecliptic, does not meet this requirement and thus cannot practically be used as an assembly point for lunar and planetary missions. Instead, for a Mission Assembly Habitat (MAH), I propose using a mission-modified version of the Zvezda habitat module currently in use on the Russian portion of the ISS. There are several reasons for selecting this habitat. First, we know it works: It has been in service for many years and has been substantially debugged. Second, it is already fitted and designed to be docked with the Soyuz spacecraft. Third, it is large enough that, along with the Soyuz, there will be plenty of room for a crew of two or three people for the time it takes to assemble the components of a specific mission. Fourth, it weighs about 19 metric tons (21 tons), which operational launch vehicles can currently handle. And finally, it shortens the construction timeline because engineers need only modify existing technology rather than invent something new. Diagram of the Zvezda module. Any of these proposals — I believe all three have merit and should probably occur in succession — would need the support of constructed mission architecture. As currently envisioned, all three proposals require a Heavy Lift Launch Vehicle (HLLV) —something like the Space Launch System (SLS) planned by NASA, or the commercial SpaceX Falcon Heavy. However, neither HLV has flown. The commercial HLLV is scheduled to be flight-worthy in 2014, while no set schedule exists for NASA's SLS. This infographic explains the Inspiration Mars Mission. Inspiration Mars plans to utilize the Falcon Heavy and the SpaceX Dragon crewed spacecraft,as well as an inflatable habitat. All three are still under development. In addition, none of this equipment has been certified as "human rated" — in other words, cleared by NASA as safe for human spaceflight. Despite the current lack of testing and certification, this mission's architecture has two advantages over the others: It is the only one of the three programs on a fixed time schedule, and it utilizes launch technology that is nearing completion. However, should any one of the three new systems fail to meet the deadline, especially the Falcon Heavy, the entire plan would be endangered. To ensure that the Mars mission occurs in any case, I suggest a backup plan using equipment that is already operational. I propose that the spacecraft be assembled at the MAH. It would consist of a modified Zvezda habitat module (similar to the MAH), a docked Soyuz spacecraft and the propulsion unit(s). The Soyuz could serve as a refuge in the event that the mission encounters a solar flare. It would also be the Earth re-entry vehicle. I envision a crew of three, all of whom would be experts in the technical operations of the ship. The sheer length of the mission and probability of some sort of equipment failure are high enough to require everyone be well versed in the mechanics of the craft. There would be no pilots or pure scientists on this trip, although many scientific experiments and studies could be conducted as a part of the mission. A diagram of the Soyuz Spacecraft. In order to achieve insertion into an orbit that will take the spacecraft around Mars and back to Earth, it will have to add about 2.2 miles per second (3.5 kilometers per second) of delta-v (change in velocity) to its 5.2 mps (8.3 km/s) orbital velocity. Again, sticking with off-the-shelf equipment, I suggest that the missions use Russian-built Briz-M propulsion units in stages to accomplish this task. Briz-M has had some reliability issues, so any alternative propulsion unit with greater reliability that is already in service and weighs no more than 20 metric tons (22 tons) could also serve this function. Several reasons inform this backup concept. First, by using tried-and-true launch equipment, the probability of meeting the mission deadline is enhanced. Second, assembling large structures from modules in LEO is established technology; the ISS is built, and many of the astronauts, engineers and technicians who did it are still alive and employed at NASA. 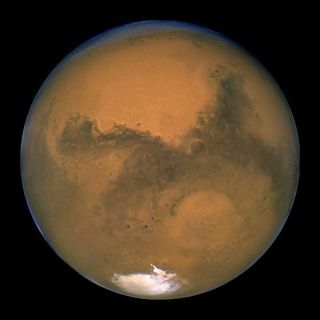 Third, the Inspiration Mars mission will be an excellent opportunity to continue to perfect assembly and rendezvous techniques that will be utilized by later missions. And it can serve as a Mars mission architecture model and an inspiration for the more ambitious Mars Direct and Mars One missions. Turnbull's most recent Op-Ed was "Midcentury Life, on Mars." The views expressed are those of the author and do not necessarily reflect the views of the publisher. This version of the article was originally published on SPACE.com.